As usual I received this book free in exchange for a review; this time via NetGalley. Also as usual I give my scrupulously honest opinions below anyway. 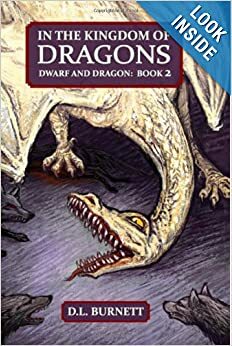 This story is written in the standard fantasy milieu featuring grumpy, irascible, greedy dwarves and large destructive dragons that ravage the countryside or protect it depending on your point of view. We also have dual narrative threads with one existing in the real world and one taking place in a sort of dragonish afterlife of sorts. On the positive side, the story flows along well enough I suppose and at least threatens to be interesting at times. There’s a reasonable amount of action but nothing you can’t tear your eyes away from. The cast of characters is broad and interesting enough, I suppose. The negative side of this book though really does a good job of overshadowing anything good about it. Firstly, it reminds me strongly of an episode of the Smurfs. For those that remember the Smurfs used the the word ‘Smurf’ to mean just about anything from expletives to Smurfberry wine. This book has the same premise except that their word is Dragon. They’ve got the Dragon guard that wears Dragon leather and they have Dragon shields and they all drink dragon blood, though it’s not clear if this is an every day thing or just an occasional thing. All this focus on dragons despite the fact that there only really seems to be one dragon in evidence early on and he’s certainly not big enough to be supplying all this leather and blood by himself. If I had a dollar for every time this book mentions drinking dragon blood I could go buy a better book… or ten. Continuing on the negative side, while the cast of characters is broad, it’s not really clear to me as a reader who belongs to which race. Characters flit into the story with almost no introduction and then vanish for a hundred pages. Those characters that are left and consistently present seem to behave in ways that don’t make a lot of sense and generally the cause given for any erratic behavior is that someone at some point has gone and drunk dragon blood, or drank the blood of someone who drank dragon blood, or been around someone who drank dragon blood. You get the idea. In summary, there’s the kernel of something good here but it seems to be just a kernel. The whole thing is so intent on talking about dragons and all the great drink recipes that exist for their life’s blood that we forgot to have a sensical plot. It’s possible that this book could be great but right now it’s just … not.